No More Chicken and Rice! 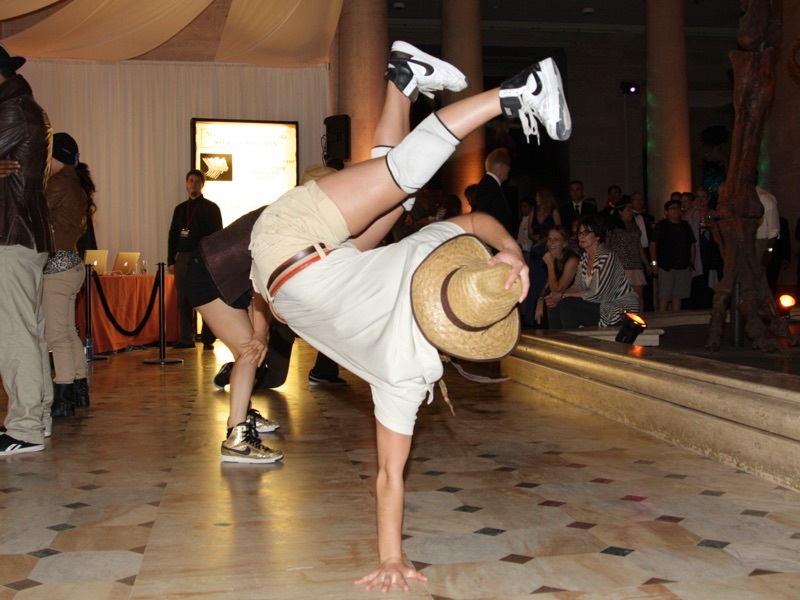 Five Creative Ways to Liven Up Your Fundraising Events! It is time to PUT the FUN BACK IN FUNdraising! Working for Handbid and being a Live Auctioneer, I have seen it all. And I’m luckier still because I am constantly exposed to new ideas that our clients are doing with their events. So, if your auction is stale and needs a facelift, read on to learn five fresh ideas to try at your next fundraising event. IDEA #1 - Skip the hotel! Look for a “unique” venue that has personality and supports the theme and mood of the event you are hosting. I have run or attended events in an automobile museum, a downtown loft (decorated with white Christmas lights), a botanical garden, a retro vodka bar, a spy museum and an auction house (for horses!)….. all of these types of spaces have a “vibe” you can’t create in your standard hotel. Think different, give your guests a reason to want to get out of the house and attend your event. Check out this venue below for a new twist on a spring auction! 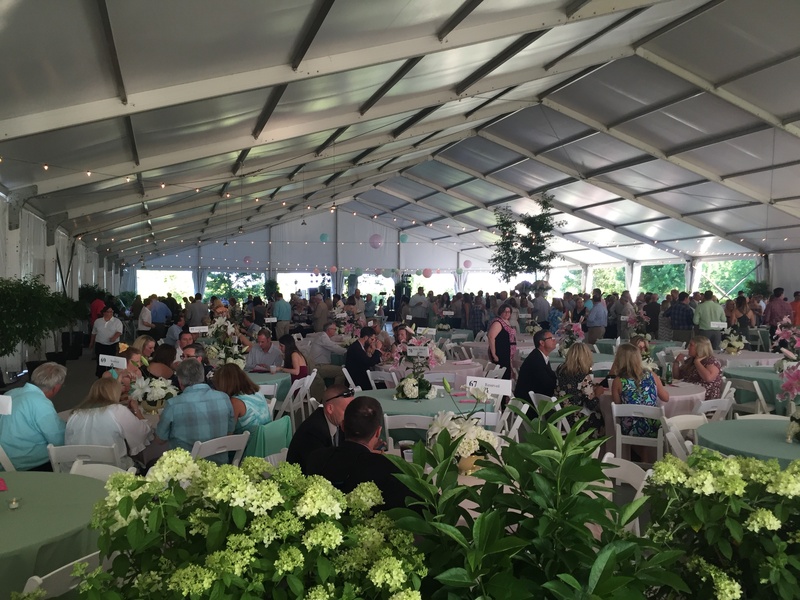 At this Handbid auction, KET's Rhythm and Blooms, they created an amazing spring / floral atmosphere. IDEA #2 - Choose stations over plates. Hosting a plated dinner may be “fancy” but it takes a long time and limits your meal choices. Why not branch out and try stations? 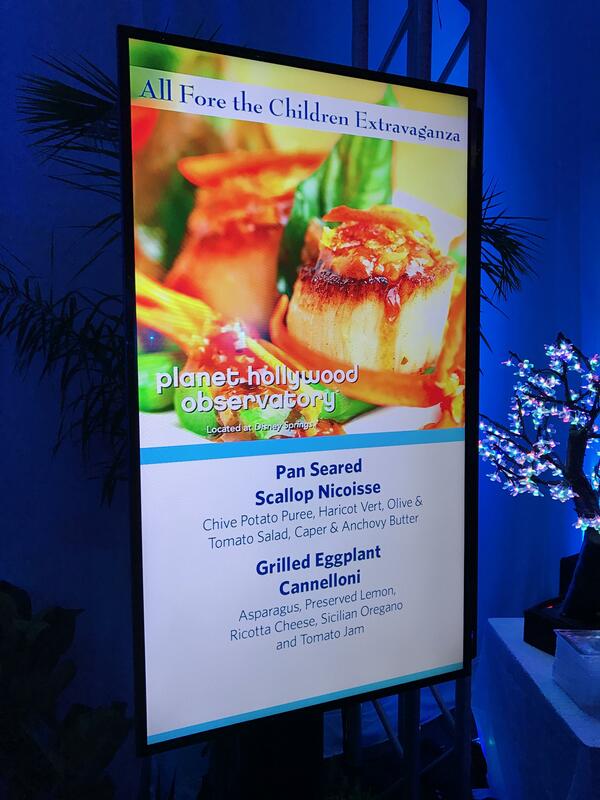 I recently attended an event where top chefs from around town all volunteered their time, talents and food (in exchange for recognition and advertising) to a great cause by setting up “tasting stations” around a museum hall. Guests were able to sample food all evening long by going from station to station enjoying a variety of different options including gourmet soups, meats, cheeses, sliders, pies, and much, much more! Ok so not everyone an setup a monitor for each station to show the food choices there, but how cool is this? We recently saw this at the Diamond Resorts Invitational auction event powered by Handbid. IDEA #3 - Let’s kill the podium parade. OK SO THIS ONE MAY NOT GO OVER WELL WITH YOUR BOSS OR YOUR BOARD - BUT YOUR AUDIENCE WILL LOVE YOU FOR IT! The Podium Parade can really slow down your show. What is it? You know that gradual procession of speakers who make their way one after the other up to the podium? You are told that they all have a 2 minute speech to give but they each take 12 minutes? To make matters worse, they are all are “important” and you are trying to figure out the best way to pull them off stage and keep things on schedule. Try this next time: Have your benefit auctioneer or emcee call them all up and interview them. This way the auctioneer keeps the timeline under control. 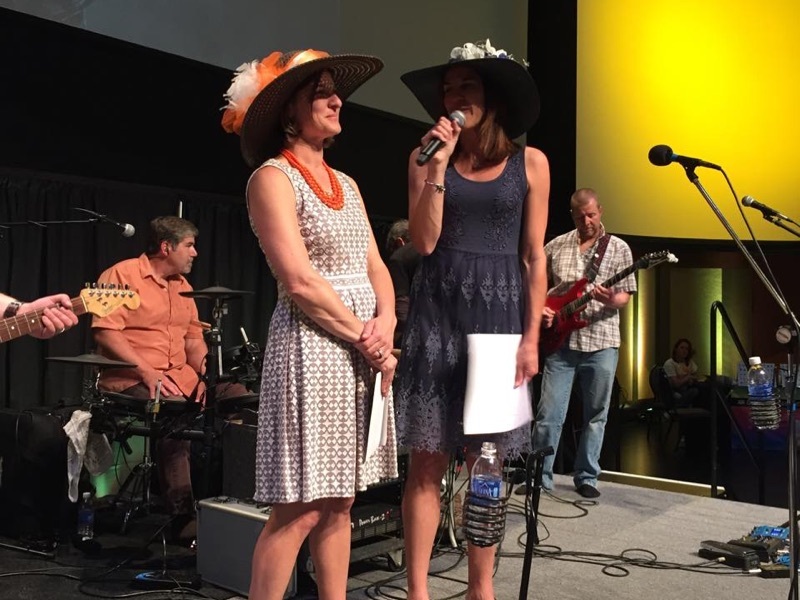 Taken at PWSA's Annual Derby Days event in Denver (the event where Handbid debuted back in 2011), here is one example of the emcee (Lori on the right) interviewing one of the PWSA Board Members (and Handbid's COO) Kari. Thanks to Lori, nothing gets off schedule. IDEA #4 - Sprinkle the entertainment throughout the night. Why wait to entertain until the end of the night? Throw in a song or two early on! Get a warm up band going early to keep people moving! (Just make sure they know when to stop playing!) You never know when the FUN is going to happen at this great event! And with mobile bidding and food stations – no need for a straight timeline. Ok so not every event has a live band - but consider having performers come up on stage at various times to keep things fresh. 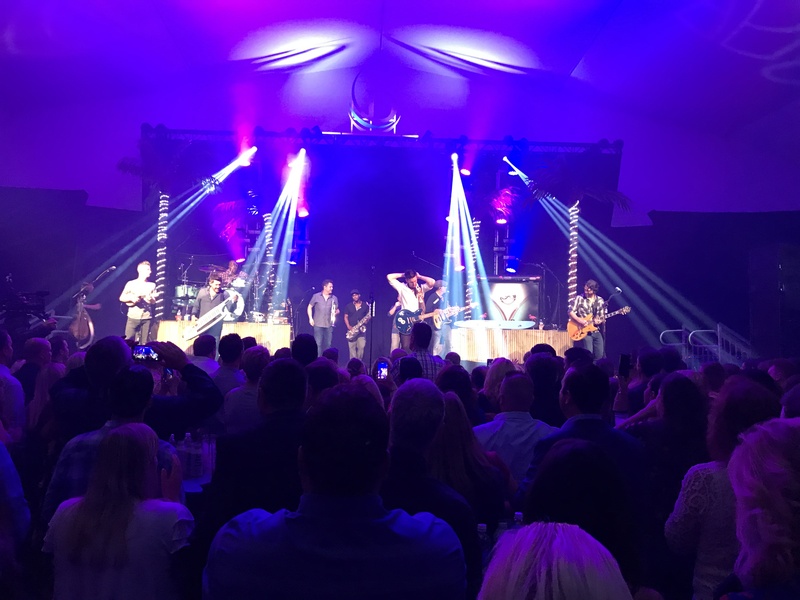 Here, Jake Owen is taking stage to entertain the crowd at the Diamond Resorts Invitational auction event powered by Handbid. 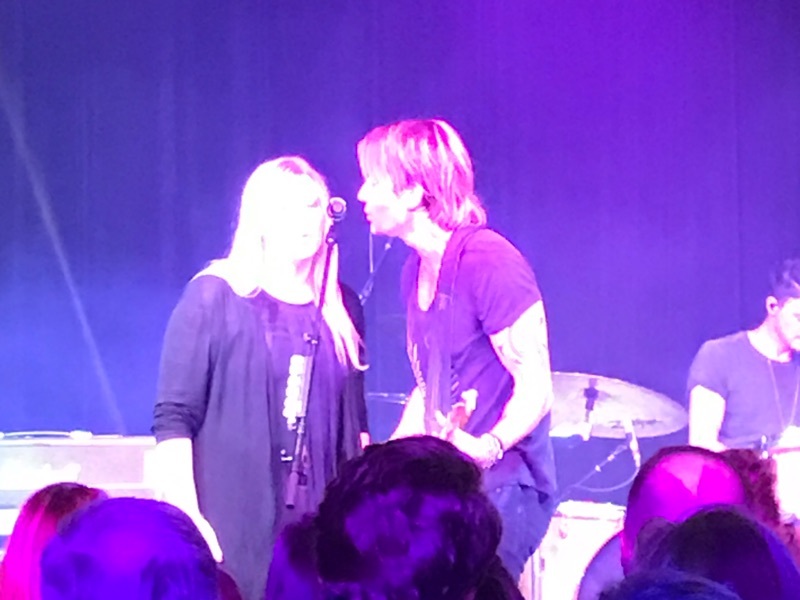 We could not resist adding just one more - here was one where a live auction winner at a Handbid auction got to sing a duet with Keith Urban up on stage. Why not fulfill that item right there on the spot before Keith jetted off to his next event? Needless to say, that was unplanned entertainment that got the crowd going again! IDEA #5 - Along with the stations, also consider making your event more interactive. Think photo booths, Coffee and Cocoa bars with marshmallows, cinnamon sticks and chocolate covered spoons. Or consider a dessert station such as a make your own ice cream sundae bar. I have seen all of these things and they successfully get your guests chatting, laughing and enjoying themselves. In addition, the more fun they have, the more likely they are to stay at the event and remain engaged in your program, appeal, and auction. 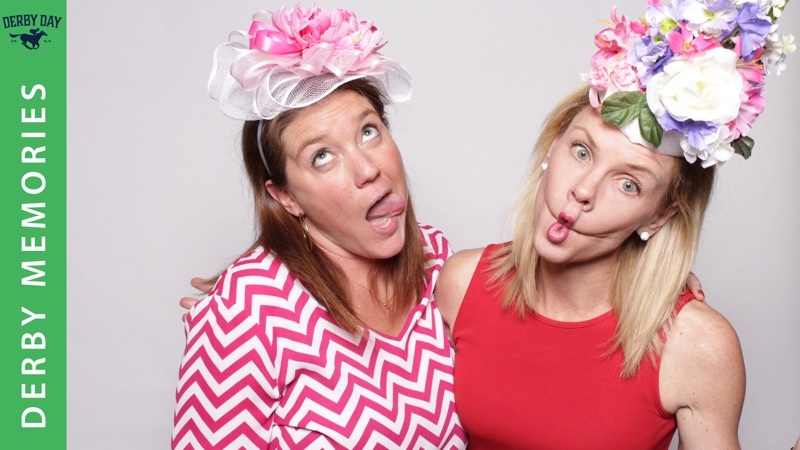 Here is a shot from the ever popular photobooth at the PWSA Derby Days event and auction powered by Handbid. So at this point, you would expect us to add in IDEA 6 - Use Mobile Bidding. But we wont go there- only because you should already be doing mobile bidding! If you aren’t then yes, consider that IDEA #0! Start with mobile bidding! To wrap up - Before you rubber stamp the same plan as last year - consider adding a few of these ideas to your next event! We hope you enjoyed this post and found some great inspiration. We have a ton more ideas to share as well as best practices. You can find many of those ideas on our Handbid University eBook page. Or you can reach out to us directly and ask questions! Either way, we are here to help!